The biggest challenge of making whole wheat bread is to get the soft, and fluffy texture with good volume. In this article, I want to share with you how do we make our whole wheat loaf in our cafe, by using the TangZhong method similar for the Japanese milk buns, one the most fluffy and souffle-like texture oriental buns. We went through a series of experiments and ongoing modification, which finally settled with the stable method which we are using today. Since most of the Asian preferred soft buns over hard rolls but yet prefer a healthy diet, whole wheat, and multigrain loaves are now available in most of the Asian bakeries. However, since Asian prefer soft buns, most of the whole wheat bread in Asia do not include more than fifty percent of whole wheat flour. This recipe consists of 33% of whole wheat flour with the addition of the starter called TangZhong 湯種. 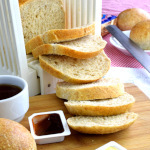 Note: If you have never made bread before, please read this article which covers all the aspects of basic bread making. The following sections explain how do we prepare our oriental version of the whole wheat loaf by using the starter called tangzhong. Tangzhong is the secret weapon in this recipe that makes the bread soft, tender and has a close crumb texture. This is the same method to make buns in China and the Hokkaido Milk Buns. Measure 25g of white flour in a small pot. Add 125ml of cold water and stir constantly to avoid forming lumps. Place over low heat and slowly heat it up until 65°C/150°F. 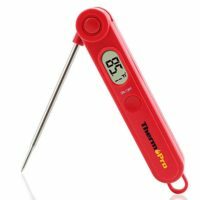 If you do not have a kitchen thermometer, heat it up until the starch turns semi-translucent and thicken. Remove from heat. Let it cools before adding to the dough. According to Harold McGee’s book On Food and Cooking, Tangzhong mainly consists of gelatinized starch. During baking, the starch granules absorb water, swell and form a rigid structure surround the carbon dioxide. As the expansion of the bubbles stops, the water inside the bubbles will evaporate, creating a network of connecting holes. In the case of Tangzhong, the starch is already gelatinized (The Conversion of solid starch into a starch-water gel) during cooking with water before adding to the dough. They do not need to be hydrated again. This plump starch granules perforated the gluten network and contributed to the spongy, light and close crumb structure. Scale the water required into the mixing bowl. Add the active dry yeast into the water. Combine all the ingredients with a spatula to make sure the yeast is fully hydrated. Leave aside for five minutes. Add the white flour and whole wheat flour to the yeast mixture. 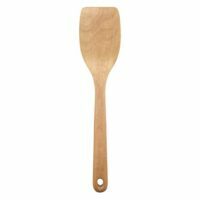 Combine the flour and the yeast mixture with a wooden spatula. White flour is made up almost entirely of the endosperm of the wheat kernel. It consists mainly of starch and proteins. Therefore they do not require additional water to keep it hydrated. However, whole wheat flour is not a refined grain, which contains germ, bran and the endosperm. Brans and germs soak up water, which will make the loaf hard and dry. That is why we need to use more water to ensure the whole wheat loaf is tender and soft. I use 63ml of water for every 100g of white flour to make my regular bread. I have increased the water amount to 70ml of water for 100g flour in this recipe to get the loaf that is soft and moist. Autolyse refers to the resting process after combining the flour with the yeast mixture. During this resting process, the enzyme of the flour will break down the starch. At the same time, the proteins called gliadin and glutenin in the flour will start to hydrate and untangled into shorter pieces, developing strands of gluten ready for kneading and folding in the following step. 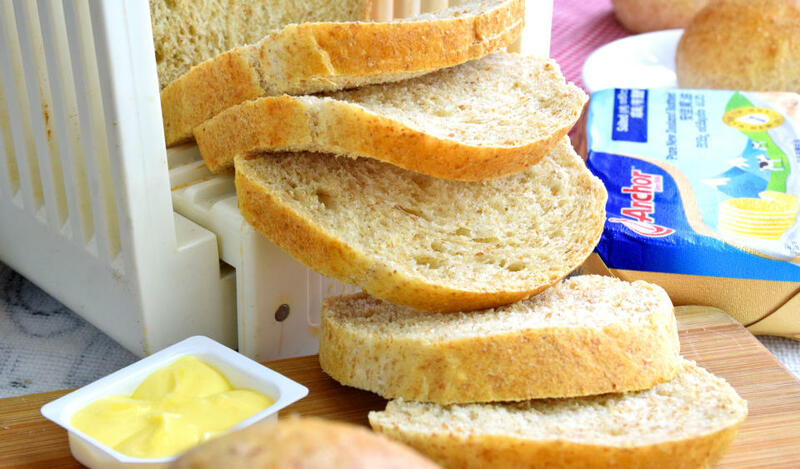 Autolyze is the crucial step to develop gluten which gives the whole wheat bread the much-needed strength. You may skip this process for dough that is made only with white flour. However, the gluten is much harder to form with whole wheat flour without autolyze first to untangle the protein pieces. Knead the dough will help to form gluten, but excessive kneading of whole wheat flour dough is counter-effective as the bran inside the flour can cut through and destroy the gluten. Hence, it has to be a controlled kneading, and the autolyze process is advantageous to develop the gluten first, which means we can shorten the kneading process and avoid the problem of over-kneading. Our preferred way to ‘knead’ the dough is to use the food processor, not the mixer + dough hook. This method seems a bit of unconventional, but the same approach has been discussed and tested by seriouseats.com. The result is astonishingly fast and successful. Add the autolyzed dough into the food processor. Add the salt and butter. Process the dough for slightly over one minutes, with occasional ‘pulse’. It is able to achieve the amount of gluten which enables to form the typical ‘windowpane’ while stretching the dough. Cold butter is added at this stage, instead of adding the melted butter to the yeast mixture earlier on. According to one explanation that I have read, cold butter will presence between the gluten strands and make the loaf lighter. As for melted butter, it will absorb into the flour which makes the loaf heavy. Fats and oils if added earlier, will bond to the hydrophobic amino acids along the protein chains and preventing them from bonding to each other, which will hinder gluten formation. Another advantage of using the food processor is that this wet dough is very sticky and make it difficult to knead by hand. So why not let the machine to do all the hard work? I believe this is because the blade of the food processor is sharp and the spin action is fast. As long as it does not cut the dough and able to drag the dough in a circular motion, it will act as a quick kneading process. The only downside is if we are making a much larger batch, we have to process the dough in batches with the small food processor. Therefore, we decided to use the conventional mixer attached with the dough hook to knead the dough for the large batch. It needs about ten minutes to achieve the desired elasticity. However, the result by using a food processor for the small batch is better. Note that I am using 30% whole wheat flour and 70% white flour in this recipe. If you increase the ratio of whole wheat flour to 50% or more, you will not expect to get the elasticity that can stretch the dough to paper thin. In that case, the endpoint is when you find that there is no further improvement of the elasticity even with more kneading. Remove the dough from the food processor and keep it in a large bowl and cover with damp cloth or cling wrap. Let it ferment at room temperature until it doubles its size. It will take 45 minutes to one hour, depends on the strength of the yeast and the temperature. The flavor will further develop during the fermentation process. It is ready when it doubles in size. If you poke deep into the dough with your floured finger, a dent will remain. Press the dough gently to remove the gas. Do it gently as not to damage the gluten strands. Remove the dough onto a floured working table. Divide the dough to the desired amount for each loaf. Flattened each portion to form a circle, either by your hand or a rolling pin. Fold the four corners towards the center, resemble making an envelope. Turn the dough over with the stretched side up. Hold the dough with your palm and rubs against the countertop in a circular motion. This rounding process helps to stretch the surface further and strengthen the gluten. Let it rest for another fifteen minutes before doing the final shaping. Press to remove the gas in the dough. Roll out the dough and then shape into loaves or buns. Let it rise at room temperature until it doubles its size. Preheat the oven until it reaches 175°C/350°F. Brush the loaf with egg wash or water before baking. Bake the bread for thirty-five minutes or until the top turns golden brown. The actual baking time depends on the size of the loaf. Remove the loaf from the oven and let it cools for twenty minutes before cutting. Cooling is crucial as it allows the moisture in the bread to escape and make it easier to slice. 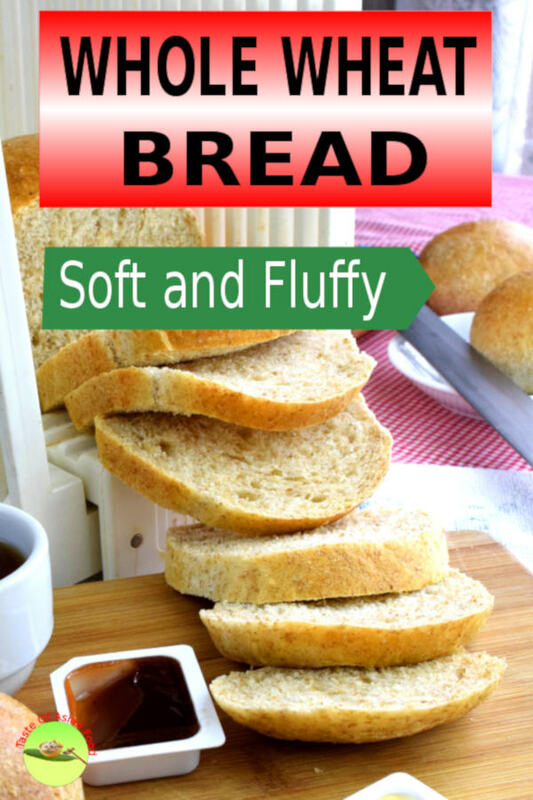 Three most essential points to deliver a soft, moist wholemeal bread with good volume. Not adding extra water is the primary reason why the whole wheat bread turns out hard and dry. The baker’s percentage should be at least seventy percent or more. 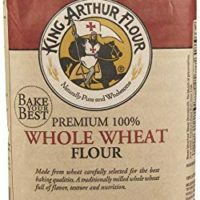 It is possible to use a 1:1 ratio of water to flour if you use whole wheat flour alone. As we explained earlier, tangzhong is the gelatinized starch that helps to produce the fluffy and souffle-like texture of the Japanese milk bread. It helps to make the whole wheat loaf soft the tender. In general, whole wheat bread does not rise as much as bread makes with white flour only. The lack of volume is because development of gluten is harder with whole wheat flour as it consists of bran and germ. Bran and germ soak up water, and hence make the dough dryer. Also, it is our natural reaction to knead the dough longer if we do not feel the gluten development is sufficient, which will tend to over-knead the dough. What happens is that the flakes of bran are acting as tiny blades slice through the gluten strands which will damage the structure of the dough and make it difficult to rise. Therefore, autolyze is essential to make it easier to form gluten strands during kneading. Finally, Since the whole wheat bread contains brans and germs that is heavy, it takes more time for it to gain volume. However, there is a limit to this. When it reaches the maximum volume that the structure can support, the loaf will collapse if the dough is over-proofed. The biggest challenge of making whole wheat bread is to get the soft, and fluffy texture with good volume.I want to share with you how do we make our whole wheat loaf in our cafe, by using the TangZhong method similar to the Japanese milk buns.This method may not be the textbook way, but I hope you will find it interesting! Best of all, it works very well. Measure the white flour in a small pot. Add cold water and place over low heat and heat it until the starch to turn semi-translucent and thicken. Add the active dry yeast, brown sugar. Combine. Add the flour and flour and combine. Let it autolyze at room temperature for two hours. Add the salt and butter. 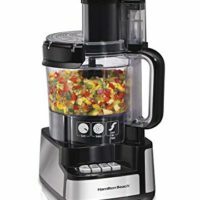 Use the food processor to blend it for one minute. Let it ferment at room temperature until it doubles its size. Divide the dough to the desired amount for each loaf. Rest for fifteen minutes. Bake the bread at 175°C/350°F.for thirty-five minutes or until the top turns golden brown. Below is a list of references we use in developing this recipe. Please refer to this article for further information. What Makes Whole-Grain Bread So Hard to Bake? Wholemeal Bread – what tips/techniques do you have? How does tangzhong (water roux) make bread softer? 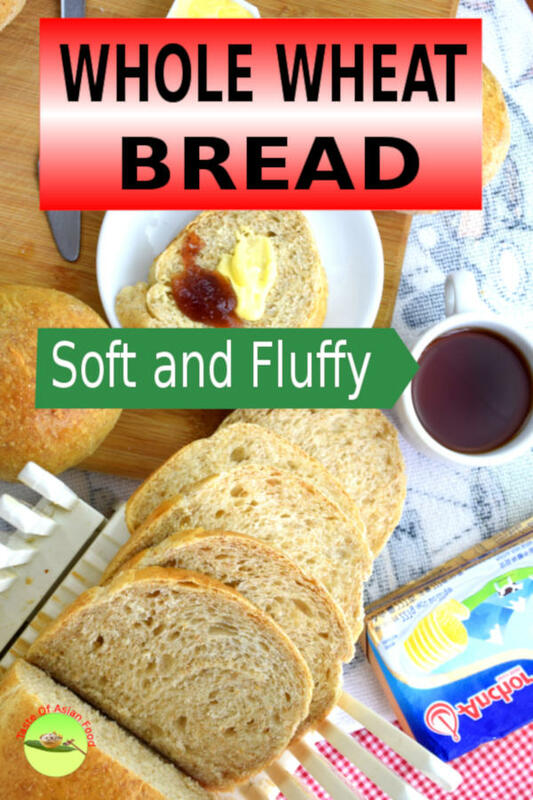 1 Response to "Whole wheat bread – How to make it soft, fluffy (Asian method)"